I can’t believe that the tastiest banana bread I’ve had in a long, long time — possibly ever — is low in fat. But it is. 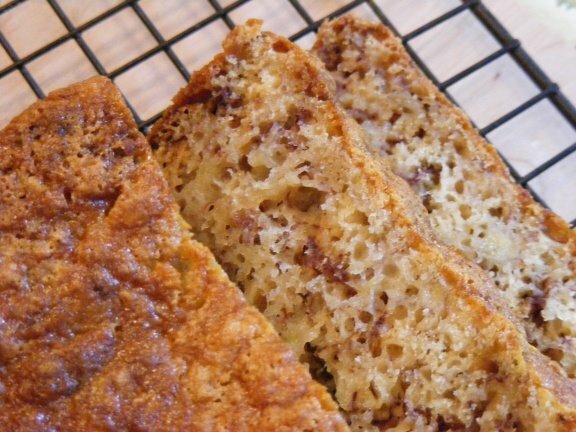 It’s moist, it’s sweet, it’s packed with banana flavor. It’s wonderful! Preheat oven to 325-degrees. Lightly grease 8 1/2×4 1/2×2 1/2-inch pan and dust with flour. In the bowl of a stand mixer fitted with a paddle attachment, beat eggs and sugar in large bowl until thick and light, about 5 minutes. Mix in smashed bananas, milk, oil and vanilla. Sift flour, baking powder, baking soda and salt over mixture and mix until just blended. Transfer batter to prepared pan and bake until golden brown on top and tester inserted into center comes out clean, about 1 hour. Turn bread out onto rack and cool.